When we moved in this house, we only had Annie – and this is what we could afford, since we wanted to pay cash for our home. Since we live in a smaller home, there are only three (and they’re small) bedrooms. To be completely honest, the kids sharing a room hardly even seems like a sacrifice to us! It was never an issue or was never really something that we thought much about. The boys are in one bedroom, and the girls are in another. I know some people feel like whenever possible kids should have their own rooms. But let me tell you – I disagree. I didn’t grow up in a large family – it was just my sister and me. I never had to share a bedroom in my life! And I certainly never had to share a bathroom with 3+ people. However, college was a rude awakening for me! It was definitely a harder transition for me at 18 than it would have been when I was 8 (or 8 months) old! That said, I think it’s really good for children to share bedrooms so they can learn to treat someone kindly and to learn to share their space with other people. If you have kids sharing a room, are they scarred for life? Probably. Just kidding – you know I’m joking! But in all seriousness, I really don’t think so. Like everything in life, there are a few cons, but in my opinion, the pros outweigh any cons! Annie had a few years when she had her own room (before Ruth Ann came along). Ruth Ann stayed in our room until she stopped feeding through the night. But, the boys don’t know life without living with each other. We will probably someday move to a larger home, but I’m still planning on the kids sharing bedrooms. I don’t think I would ever want a 5 or 6 bedroom house, which is what it would take for everyone to have their own room. For one thing… I don’t want that much house to clean! I really like the lessons they are learning in sharing space, listening to each other, helping each other clean, spending time together at night as they’re falling asleep. Annie helping Ruthie get up in the morning and bringing her down the hall brings me joy. Hearing them giggling and playing with one another every morning as they wake up together is lots of fun (as long as it isn’t too early). Y’all – my kids really do have great friendships with one another. Do they still fight, call each other names, and hurl toys at each other some times? Well, yes, because after all, they’re still kids! But our kids really get along well. They enjoy their time together and have never once complained about sharing a bedroom. I mean, they really don’t spend tons of time in their bedrooms anyway! Most of their awake time is spent in the downstairs family room, living room, or kitchen, or playing outside in the yard or on the back porch. But they wouldn’t have it any other way! Our goal is that our kids love each other and still want to be friends when they grow up and move out as adults. If you are in a smaller home, you might be worried that if you have more kids, you’ll have too many kids sharing a room. Don’t let that keep you from growing your family. Please don’t be worried! Kids adjust and adapt – just like you did when you became a parent. Think about it. Be encouraged today that if you have lots of kids sharing a bedroom today, your kids won’t be scarred for life! 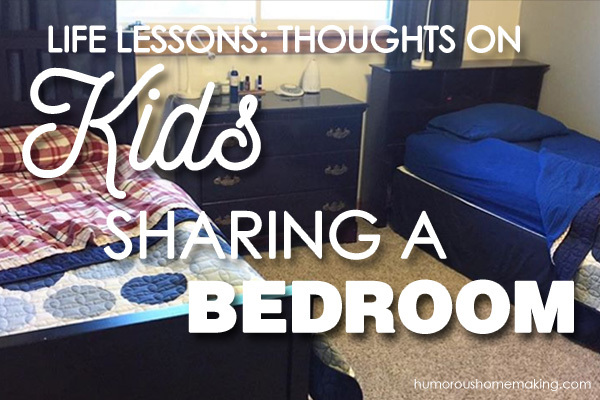 If anything, sharing a room just better prepares your kids for the rest of their lives. Did you share a bedroom when you were younger? 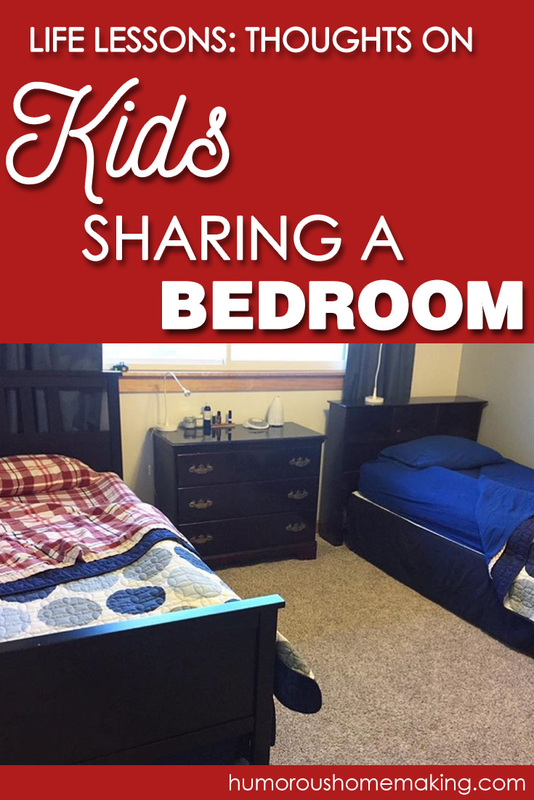 Are your kids sharing a bedroom now? My mother was widowed young. She, my brother and I always lived in 2 bedroom apartments. I shared a bedroom with my mother until i was 19 years old. Let’s just say I didn’t get away with much while I was in high school. I shared rooms with 2 or 3 other girls in college. I didn’t have my own room until i was 25 years old and i got married at 27. My boys shared a room for about 2 years, then my daughter moved to the basement. I never worried about them having their own rooms or any kind of private space. i think kids behave better when they don’t have so much freedom. That’s the truth! Kids don’t need ALL that freedom. And I think those of us who shared bedrooms and had roommates most of our lives are better for it. Thanks for commenting, Lou. Just a quick comment….I have no thoughts either way about sharing rooms, I think it depends on the size of the home and how many children you have but I will say this. We have a smallish home with smallish bedrooms and we always thought of this as kind of a starter home. We filled our home with children and we homeschooled. We were crowded and cozy and our kids just kept growing up and the years passed. Then they started leaving. And we were still in our smallish house. So now we have 1 left and she’s 11. And our smallish home is feeling about right. lol. We will not be getting a bigger home cause you know what? The house empties up before you know it and I will have too much space to fill and clean. I know you feel like I do….I don’t want to spend too much time cleaning, I want to enjoy clean and neat and then live life. So this small house will be perfect, just enough for me and my husband to take care of and shut the door on the spare rooms. And enough room for grands, when they happen. It’s all 1 level and relatively easy upkeep and we will need that as we age. I have seen so many people with huge homes face the dilemma of not being able to keep up with it when they face retirement or aging. Just a thought. Thanks for taking the time to comment, Rebekah! It is so true that everyone will grow up and leave soon enough. And thanks for the reminder that having more house means more time and expense to keep it up! Appreciate your thoughts on this post! I shared a bedroom with my sister and my 2 brother shared a room. We survived and it didn’t scar us! I never had my own room until my late teen years. I agree – we all turned out completely normal. Lol. It’s good for our kids! Thanks for commenting, Kathy. I totally agreed about the college comment. I, too, never had to share a bedroom growing up, and it was a rude awakening for me (and my roommate, who had to put up with me!) when I had to SHARE! I think, too, it hindered my relationship with my 7 years younger sister. We might have actually had a relationship if we had had to share and spend some time together. Now as adults we have made a relationship, but that should have been begun as children, and sharing a bedroom would have helped. My husband and I have 8 children, only 7 of whom have been at home at one time. Our home is three bedrooms, so, like Stacy, we have a boys room and a girls room. Yes, that is uneven. When you have two boys, they have more space than do five girls in a room. The girls have the bigger room, and bunkbeds make that possible and manageable! Clothing storage is the challenge for them. I can speak from experience. My husband and I have 3 sons and 1 daughter. They are 4 years 10 months from oldest to youngest. They are now in their 30’s. In our first house they were in 1 room even though we had 3 bedrooms. Daughter was just too scared of being alone. Then we built our own house and all lived in 1 very large bedroom. When we got ready to build the rest of the house guess what 3 teenage boys wanted to stay in 1 large room? Yep they were and still are best friends. I was saddened seeing other teenagers being nice to their friends and rude to their own siblings. It was like they were strangers. So make up your own mind but in our family it was the decision we made. Amen! I think ideally, a child’s first and best friends should be their siblings. How awesome that your boys are best friends. Love it! Thanks for the comment, Jackie! Love this – definitely a win-win! Thanks for taking the time to share! My 3 boys have all shared a room since they were little and it’s been fine. They can sleep through anything (my oldest has developmental delays and is a horrible sleeper)and its forced them to learn how to share. Now that they are 15, 13, and almost 11, their tiny room is getting small and they sometimes beg for their own space but we aren’t moving (we live in California and in the land of obscenely expensive homes bigger is not an option)so it forces them to learn how to deal with it…an important skill! I agree with all of this! Thanks so much for your thoughts! My only caveat is what if there is a significant age difference between the children sharing a room? For instance, my 8-year-old daughter shares a room with her one-year old sister. We are in a three-bedroom house, and their older brother occupies the 3rd bedroom, so we have no choice except for the girls to share. Sometimes I feel like it is a little unfair to my eight-year-old to make her share her room with an infant/toddler. Can that really work long-term? We are on the fence about getting a house with one more bedroom so that our eight-year-old can have her own space. Would love your thoughts! Sorry this comment went to spam so we are just now seeing it! I think that while it may be harder on that older sibling to share a room with a younger sibling, initially, it could be Healthy long-term. It helps both children develop the traits of patience, love, and unselfishness that comes from spending so much time with someone else and not just putting their own needs first. Good luck, Tara!